A rash refers to an inflammation on the skin, which can cause a change in skin texture or color. Depending on the cause, it can be localized or wide-spread on your skin. You could feel itchy, irritated; the skin could be scaly, discolored, painful, dry and even have sores. However, sometimes you could notice a non-itchy rash. What causes it? Read on to learn about it. Rash That Doesn't Itch, Why and What to Do? When your skin comes in contact with an irritant, it can cause a dry, non-itchy eruption. Certain chemicals like detergents or other cleaning and industrial products can cause this contact dermatitis. Though these chemicals affect everyone, some people are more likely to have a reaction than others. Areas with thin skin, like eyelids or neck, are more vulnerable. Depending on the type, duration and amount of the irritant, the severity of the irritation varies. What to do: Wash the affected area thoroughly. Stay away from the irritant and resort to medications to heal it. Exposure to drugs, like diuretics, antibiotics or anti-seizure pills, can result in eruptions, either as a direct side effect or an allergic reaction. 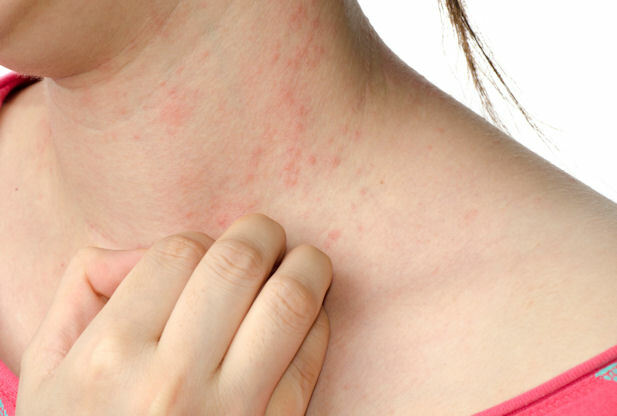 This kind of rash doesn't itch, occurs within a few days of taking certain medicine and starts as a series of red spots that then spreads over large areas on the body. What to do: If you notice any rash that doesn't itch after new medications, it is advisable to stop it after the doctor's consent. The inflammation would disappear in a few days. However, sometimes these outbreaks could indicate a severe allergic reaction in your respiratory tract and need medical attention. This is caused by a skin friction induced inflammation. It occurs on moist and warm areas of the body, including the groin, under your breasts, abdominal skin folds, armpits or between your toes. These areas could be sensitive or painful. In severe cases, it could form sores, cracks in the skin or bleeding. Though intertrigo is not usually itchy, at times it could cause an itch. What to do: Keep the area dry and clean to reduce inflammation. Also, wear loose clothes and use a powder to reduce friction. Sometimes, losing some weight can reduce the frequency of intertrigo. The most common and mild heat rash is miliaria crystalline. It appears as small, clear-white, fluid-filled bumps on your skin surface. These small bumps are sweat bubbles that often burst open. It is very common in babies, rather than adults, and doesn't itch. Another type of heat eruption is miliaria profunda. Though rare, it can occur frequently in some adults after a bout of excessive physical activity. It forms large, skin-colored bumps and originates from deeper skin layer, the dermis. Sometimes you could notice nausea or dizziness due to the lack of sweat as a result of this inflammation. What to do: Wear loose clothing and minimize sun exposure. Also, do not use thick skin lotions, as they could clog your pores. Do not use skin-drying fragrant soaps. However, if you notice chills, nausea or fever accompanying your heat eruptions, seek medical attention. Called as Christmas tree rash, it occurs as a large round patch on your abdomen, chest or back. The first appearance is a large spot (about 4 inches wide), called as herald patch, and thereafter it spreads as small patches to adjoining areas. The patches form a pattern like the drooping branches of the Christmas tree. Though present in every age group, it is more common amongst teens and people of 20-35 year olds. Mainly it is non-itchy, but can itch some people. What to do: The outbreaks resolve on their own within 6-10 weeks. However, if it itches, your doctor would prescribe medicated lotions or antihistamines. Viral infections, like Chicken pox, measles or roseola viruses, can cause a rash that does not itch. If your child is suffering from a fever above 103°F, it could result in mild inflammation all over the body and cause a pinky appearance. Some babies suffer from infections due to diaper, drools, cradle caps, erythema toxicum, etc. Certain acne or skin boils can cause a rash-like appearance. Even ringworm or impetigo infection could cause rash on the skin that doesn't itch. Outbreaks in kids are very common due to their sensitive skin. However, do not panic and read the following ways to care for your child. Widespread skin infections that occur due to viruses require no treatment and usually disappear within 2 days. Boils due to fever will clear when the fever reduces. However, if the inflammation is due to an irritant, you need to wash the area with soap to remove any traces of the chemical. Do not use any cream on boils and clean with water only. For dry eruptions, apply a hand lotion 2 times a day. In case it turns itchy, you could use 1% hydrocortisone cream, 4 times in a day.